The Israeli Supreme Court had ruled in December that Amona be evacuated by Feb. 8 for being built on private Palestinian land. 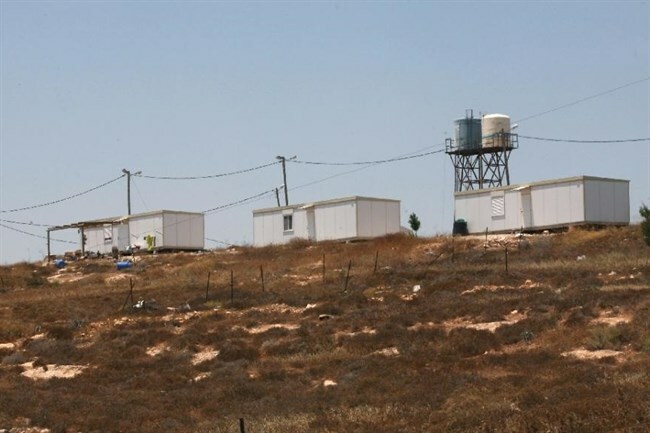 However, Israeli authorities plans for the relocation of Amona settlers have been contested, as the planned new settlement housing units would be located on the private property of several Palestinian landowners in nearby villages.Meanwhile, Palestinian residents of the Ramallah-area village of Silwad were expecting a hearing later on Tuesday afternoon objecting to plans by Israeli authorities to confiscate lands from their village to build housing for settlers evacuated from the illegal Amona outpost.The objection, presented by human rights group Yesh Din lawyer Shlomi Zakariya, claims that Israeli authorities deliberately did not give enough time to Silwad residents to go through the Israeli plan in order to escape legal accountability, adding that the settler relocation would harm Silwad landowners and be tantamount to Israeli political submission to Amona settlers. Cairo (dpa) – The al-Qaeda-linked Fatah al-Sham Front has unified ranks with jihadists in volatile northern Syria, a monitoring group reported Saturday, a move likely to stoke infighting among rival insurgents in the area. The Syrian Observatory for Human Rights added that Fatah al-Sham has merged with four factions including the powerful Noureddine al-Zinki movement and set up a coalition called the Levant Liberation Body. The new alliance is led by Abu Jaber Hashem, an ex-commander of the Ahrar al-Sham, a conservative Islamist movement, which has been locked in fight against Fatah al-Sham in the north-western province of Idlib and adjacent province of Aleppo. “This new entity will place pressure on other armed factions and push them to choose between either joining this entity led by Fatah al-Sham or becoming neutral in the fighting,” Mohammed al-Shami, a commander in the rebel Free Syrian Army, told dpa. The alliance comes two days after Ahrar al-Sham merged with six rebel factions in response to a wide-scale attack mounted by Fatah al-Sham. Clashes began as Fatah al-Sham launched an attack Tuesday on posts of Ahrar al-Sham in Idlib and Aleppo, after the al-Qeada-linked group accused rebel factions, which took part in talks held in the Kazakh capital of Astana earlier this week, of conspiring against them. Fatah al-Sham has also accused some rival insurgents of supplying information to the United States to strike their posts in Idlib. The militant group has lost several senior leaders in stepped-up US drone strikes in Syria over recent weeks. Fatah al-Sham and the Islamic State extremist militia are excluded from an ongoing shaky ceasefire in Syria. The truce, brokered by Russia and Turkey, went into effect at the end of December. Despite the ceasefire, government forces and rebels fought for weeks in an area where the main source of water supplies to the capital Damascus is located. On Saturday, regime forces and repair workers arrived at the springs in the Wadi Barada near Damascus under a deal with local rebels, the Observatory said. Repair teams have begun examining the Ein al-Fijeh spring and water pumping station, and the capital’s supply may be reconnected within days, the watchdog added. An estimated 5.5 million people in the Damascus region have suffered severe water shortages since the facilities were damaged in late December, several days into a government offensive on the rebel-held area north-west of the capital. The warring parties blamed each other for the damage. Repair crews began work on the spring in mid-January under an agreement between local rebels and the government, but were pulled out again a day later after a government-appointed mediator was shot dead under disputed circumstances. The fighting in the Barada river valley around the spring was a source of contention at the two-day talks held in Astana between government and rebel negotiators. Rebels insisted the fighting was a breach of the Russian-Turkish brokered ceasefire, while the government side said its operations in the area were aimed at terrorists and would continue. The Astana talks saw both sides affirm their commitment to the truce. The sponsors said they would set up a trilateral implementation mechanism for the ceasefire, although they gave no details as to how it would work. 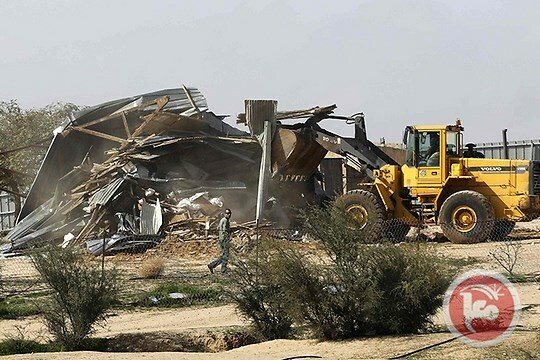 NEGEV (Ma’an) — The Arab Lawyers Union in Israel said Monday that it would attempt to file a court order to stop the demolition of newly donated mobile homes, which were delivered to the village of Umm al-Hiran on Sunday. Israeli police spokesperson Micky Rosenfeld told Ma’an at the time he was not aware of the incident. A representative from the local Israeli municipality could not immediately be reached for comment on the impending demolition. Eight homes and seven agricultural structures were razed to the ground in Umm al-Hiran on Jan. 18, hours after locals, activists, and Palestinian members of Israel’s parliament, the Knesset, gathered to resist the evacuation, sparking clashes with Israeli police that left two people killed under widely contested circumstances. On electricity poles flutter flags of the People’s Protection Units (YPG) and its Women’s Protection Units (YPJ) — the defense forces of the Democratic Federal System of Northern Syria, still known informally as Rojava. Streets are controlled not by the army, but by the Kurdish Asayish (a Kurdish security organization) units. After two meetings arranged by Russians at Khmeimim air base between the regime and the Kurds, a third meeting was held in Damascus, but without any representatives of TEV-DEM and the Kurdish nationalist Democratic Union Party (PYD), the dominant forces of the region. Only the less influential groups were invited, which raised questions about Damascus’ intentions. Gweriye said the regime is flexible on some issues, such as allowing Kurds to use their native language in education and to accept that all parties are responsible for security in their areas. “Damascus thinks of expanding the power of local administrations. They agree to Asayish to serve as local police, but they don’t want to discuss a comprehensive security system with them. For Damascus, the status of YPG, YPJ and Syrian Democratic Forces is not up for discussion,” he said. A state of tension has prevailed in Nafha prison after Israeli special forces violently stormed section 2 at dawn Tuesday. A prisoner reported from the jail that dozens of Israeli special forces violently stormed and searched the section and subjected some of the prisoners to strip search. The prisoners were then transferred to section 12, he added. Damascus, Syria (1:23 A.M.) – Syrian forces intercepted a smuggling car loaded with armament destined for the deignated terrorist group Jabhat Fateh Al-Sham (formerly Nusra Front) in Dara’a countryside. The shipment consisted of five US-manufactured TOW missiles, 30 grenade launcher rounds, dozens of RPG missiles, and a large amount of rifle ammunition. According to a Syrian Army source, the military received information about this shipment and its designated destination through an anonymous rebel source (likely a rival faction). Noticeably, there has been a spike in weapon smuggling in Damascus’s vicinity as the SAA managed to halt a series of TOW missile shipments last of which was in Barzeh district of Damascus. It is not unlikely that a foreign sponsor is invested in initiating a major battle in the capital where rebels find themselves increasingly isolated and choked with every passing day. In the old city of occupied al-Khalil (Hebron), Palestinians’ freedom of movement is impeded by a large number of Israeli checkpoints. In the Tel Rumeida neighborhood, many school-children and teachers are forced to pass at least one, often more, checkpoint daily on their way to school. 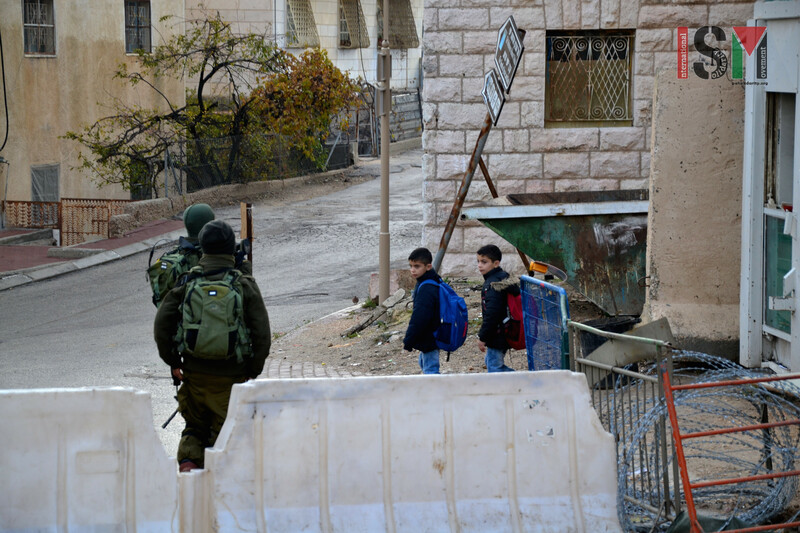 The Israeli occupation seriously disrupts the right to education for Palestinians in al-Khalil. One of the checkpoints that Palestinians have to pass in the Tel Rumeida neighborhood is the ‘Gilbert’ checkpoint in the heart of the Tel Rumeida neighborhood. This checkpoint divides the neighborhood, enforcing the Israeli forces’ checkpoint regime on Palestinian residents only. Israeli settlers enjoy full freedom of movement and rights in and around the illegal settlements. This photo-story of the Gilbert checkpoint illustrates what this limitation of movement means to Palestinian civilians in every day life. 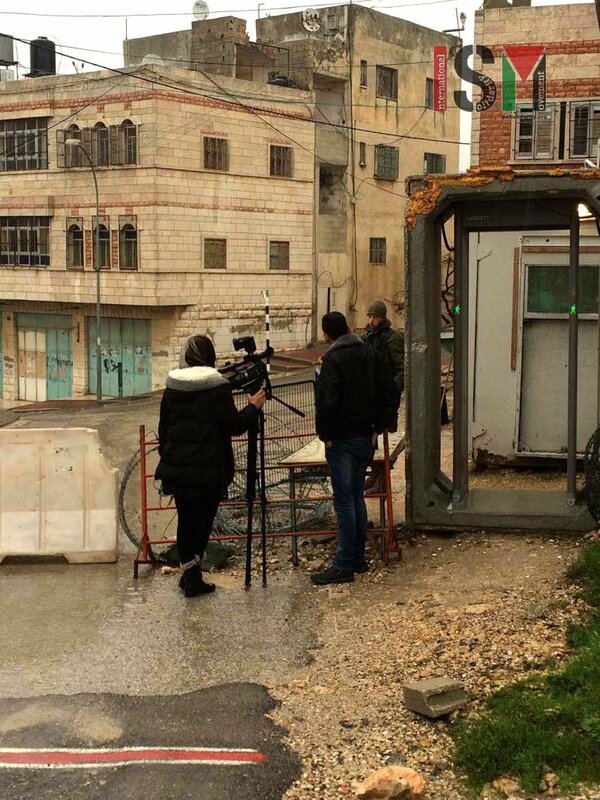 Palestinian journalists were denied entry through the checkpoint. They were on their way to Shuhada Street to document Palestinian school children walking through checkpoints on their way to school. Palestinian school-boy has to pass his school-bag for a bag-search, before being allowed to continue on his way to school. Israeli soldier searching the bag of a Palestinian woman. Officially, these bag-searches are for ‘security purposes’, but Israeli forces often arbitrarily search only some bags. At this checkpoint they mainly search women’s bags, while allowing men to pass without being searched. 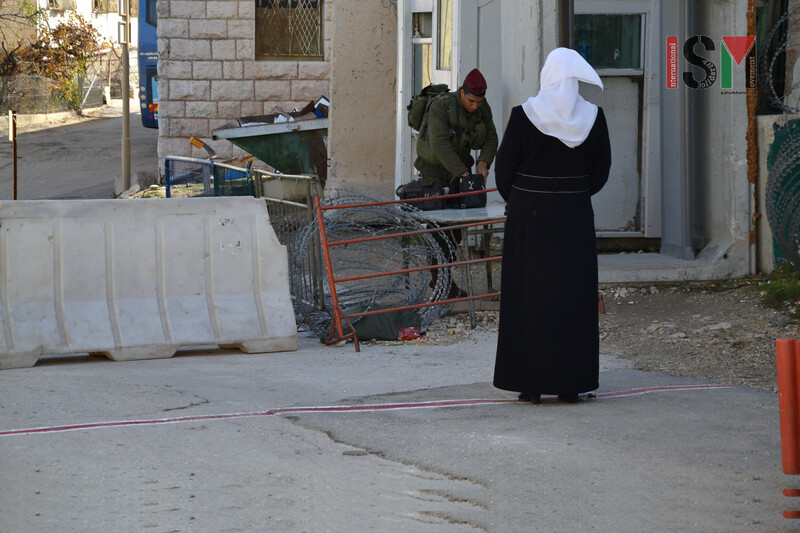 Palestinians are robbed of even the tiniest bit of privacy at the Israeli forces’ checkpoints. 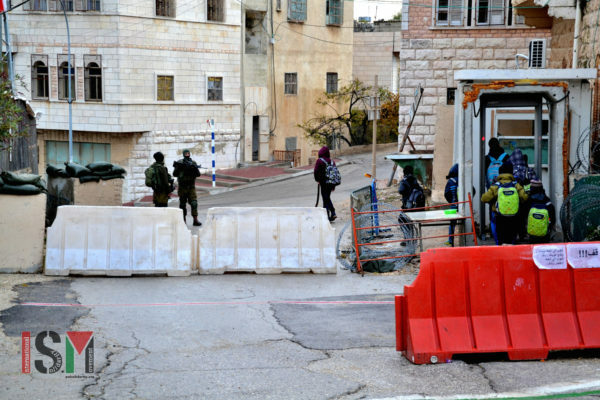 Group of Palestinian school children passing through Israeli military checkpoint. Children are not exempt from the Israeli forces policies and are forced to pass metal detectors daily. On their way to school. Israeli forces sometimes search their bags or force them to wait while checking another Palestinian. Palestinian child passing through checkpoint and past a large group of Israeli forces on his way home. An ‘innocent’ childhood is denied to Palestinian children living under Israeli military occupation. Sadly, they have to pass large groups of heavily-armed soldiers on the way to school. The practice of soldiers conducting exercises of how to shoot Palestinians to death at checkpoints in civilian Palestinian neighborhoods are the norm rather than the exception. Palestinian school children passing Israeli military checkpoint on their way to school. 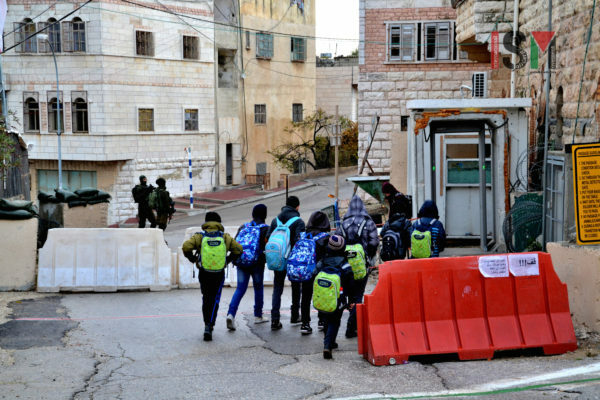 These checkpoints often are the reason for Palestinian school-children to reach school late, as they might be delayed, denied to pass or searched. Palestinian man is forced to wait at the checkpoint, but forced to move several meters back, as Israeli forces check his ID, violating his freedom of movement. 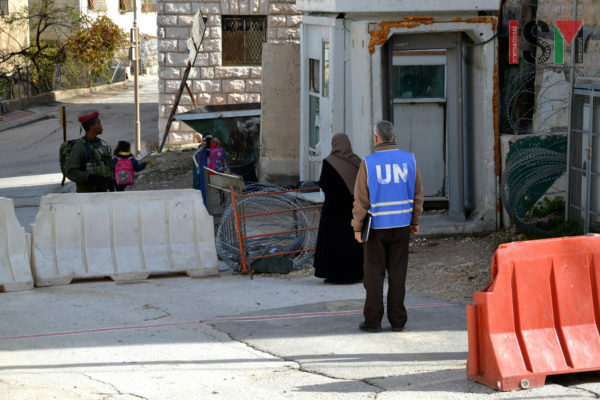 Israeli forces are detaining a Palestinian woman at the checkpoint, unaware that a member of a UN delegation is present. According to international law and the recent UN resolution, Israeli settlements in the Israeli occupied West Bank are illegal. 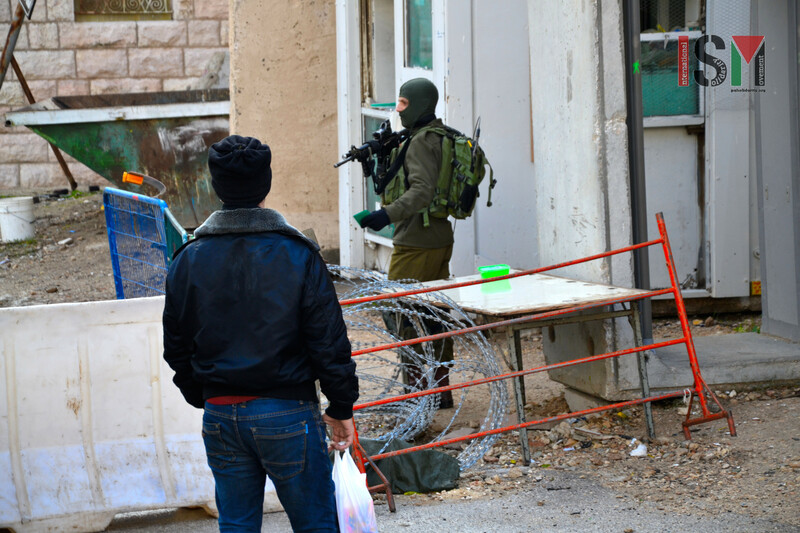 Israeli forces ‘checking’ Palestinian shop located near the checkpoint. All commodities and general necessities have to be bought on the other side of the checkpoint, as the area locked up within the checkpoints has no shops. 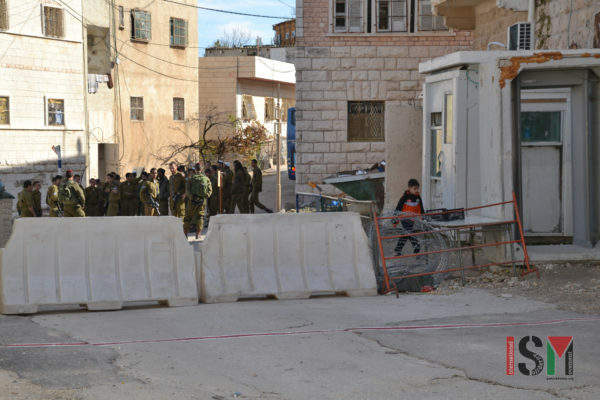 So, whenever a Palestinian needs to buy groceries, he or she must pass the checkpoint. Palestinian school-children turn around as Israeli forces call them back. 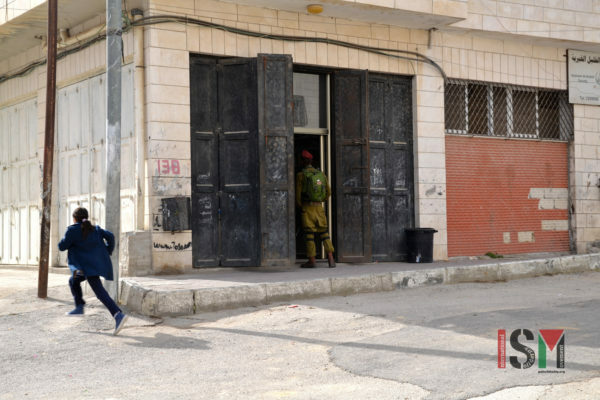 Having passed the metal detector doesn’t always mean that soldiers will allow you to pass: even after passing through the checkpoint, soldiers from time to time will stop and inspect Palestinians again. President Trump has not signed the expected executive order on establishing safe zones in Syria, but the White House has insisted that Trump and Saudi King Salman had agreed to the idea during a weekend phone call. Syria has not been brought into the discussion, however, and that’s not sitting well with Syria. Foreign Minister Walid al-Moallem warned during a meeting with the UN refugee agency that any attempts to establish a safe zone without coordination with their government would be inherently unsafe, as well as a violation of Syrian national sovereignty. There have been no details offered by the Trump Administration on what form the safe zones would take, and Pentagon officials were said to be quite concerned by what they considered an “ambiguous” proposal. Publicly, Pentagon officials had urged people to withhold judgement until more details were offered. The safe zones were originally reported to be part of the refugee ban executive order, but was not contained in the final draft. The reports said the order was to give the State Department and Pentagon 90 days to come up with a plan for the safe zones. 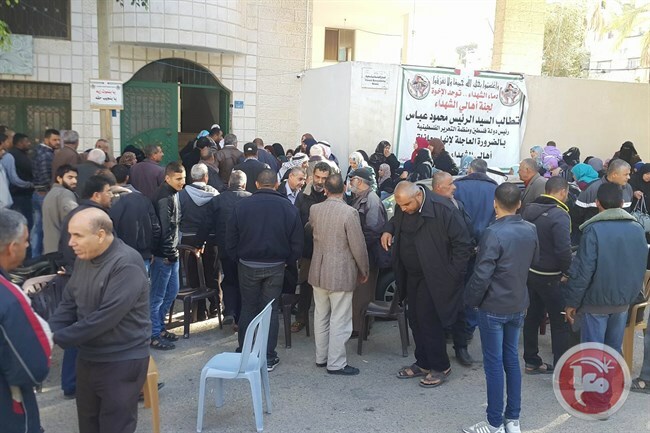 GAZA CITY (Ma’an) — Dozens of relatives of Palestinians killed during the 2014 Israeli military offensive on the Gaza Strip broke into the office of Palestine TV on Tuesday. A source in Palestine TV’s Gaza City office confirmed to Ma’an that live transmission from Gaza had stopped as a result of the situation. 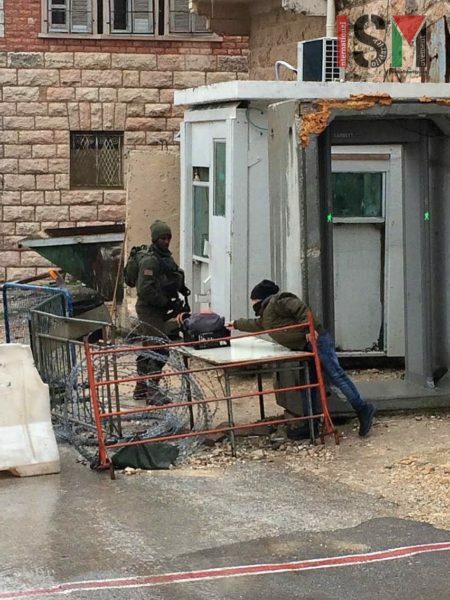 Israeli soldiers invaded, earlier Tuesday, the West Bank city of Hebron, and abducted one Palestinian from his home. The soldiers also summoned a former political prisoner, from Beit Ola town, for interrogation. Media sources in Hebron said several military vehicles invaded Abu Romman Mountain area, searched homes and abducted one Palestinian, identified as Zeidan Radwan Abu Aisha. 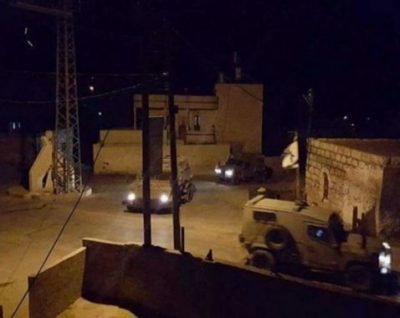 The soldiers also invaded Beit Ola town, west of Hebron, searched homes and summoned a former political prisoner, identified as Raed Abdul-‘Afo al-‘Emla, for interrogation in Etzion military base, north of Hebron.